In recent years, mini wind energy has been developing in a spectacular way. According to estimates by the WWEA-World Wind Energy Association, the level of development of the mini wind energy industry is not the same as that of the wind energy industry, although forecasts are optimistic. The main reason is that the level of efficiency of small wind turbines is low. To address this problem, the UPV/EHU’s research group APERT (Applied Electronics Research Team) has developed an adaptative algorithm. The improvements that are applied to the control of these turbines will in fact contribute towards making them more efficient. The study has been published in the journal Renewable Energy. 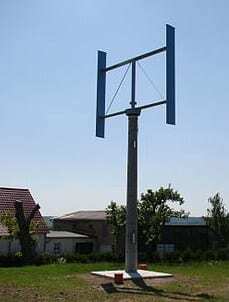 Small wind turbines tend to be located in areas where wind conditions are more unfavourable. “The control systems of current wind turbines are not adaptative; in other words, the algorithms lack the capacity to adapt to new situations,” explained Iñigo Kortabarria, one of the researchers in the UPV/EHU’sAPERT research group. That is why “the aim of the research was to develop a new algorithm capable of adapting to new conditions or to the changes that may take place in the wind turbine,” added Kortabarria. That way, the researchers have managed to increase the efficiency of wind turbines. The speed of the wind and that of the wind turbine must be directly related if the latter is to be efficient. The same thing happens with a dancing partner. The more synchronised the rhythms of the dancers are, the more comfortable and efficient the dance is, and this can be noticed because the energy expenditure for the two partners is at a minimum level. To put it another way, the algorithm specifies the way in which the wind turbine adapts to changes. This is what the UPV/EHU researchers have focussed on: the algorithm, the set of orders that the wind turbine will receive to adapt to wind speed. “The new algorithm adapts to the environmental conditions and, what is more, it is more stable and does not move aimlessly. The risk that algorithms run is that of not adapting to the changes and, in the worst case scenario, that of making the wind turbine operate in very unfavourable conditions, thereby reducing its efficiency. Efficiency is one of the main concerns in the mini wind turbine industry. One has to bear in mind that small wind turbines tend to be located in areas where wind conditions are more unfavourable. Large wind turbines are located in mountainous areas or on the coast; however, small ones are installed in places where the wind conditions are highly variable. What is more, the mini wind turbine industry has few resources to devote to research and very often is unaware of the aerodynamic features of these wind turbines. All these aspects make it difficult to monitor the point of maximum power (MPPT Maximum Power Tracking) optimally.“There has to be a direct relation between wind speed and wind turbine speed so that the monitoring of the maximum point of power is appropriate. It is important for this to be done optimally. Otherwise, energy is not produced efficiently,” explained Iñigo Kortabarria. Most of the current algorithms have not been tested under the conditions of the wind that blows in the places where small wind turbines are located. That is why the UPV/EHU researchers have designed a test bench and have tested the algorithms that are currently being used —including the new algorithm developed in this piece of research— in the most representative conditions that could exist in the life of a wind turbine with this power. “Current algorithms cannot adapt to changes, and therefore wind turbine efficiency is severely reduced, for example, when wind density changes,” asserted Kortabarria. April 1, 2019 - Proposed Bill Could Limit Small Towns' Ability To Regulate Wind Turbine Construction WBAAAs the debate about wind power continues in West Central Indiana, proposed legislation could limit small towns' ability to regulate turbine construction. April 16, 2019 - Wisconsin wind turbine project pits brother against brother, clean energy against rural vistas Milwaukee Journal SentinelAdvocates say renewable energy will invigorate their town. But others worry both their property values and health are at risk from towering turbines.